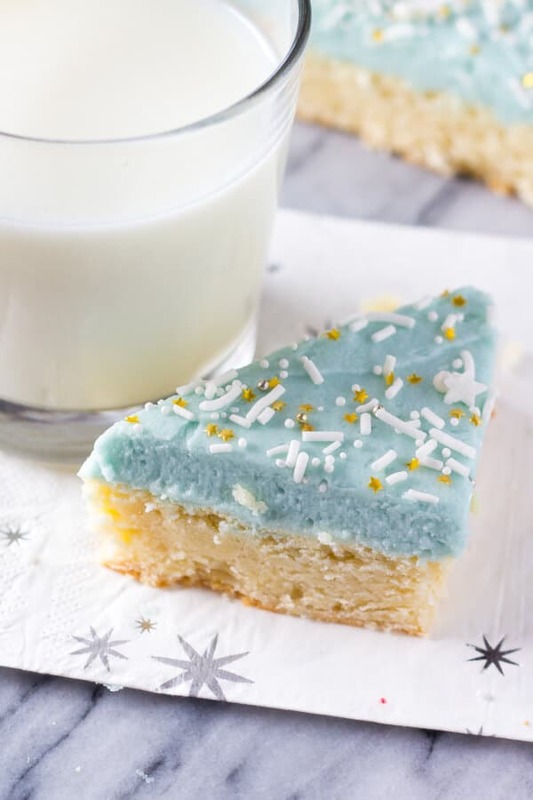 These soft and chewy Frosted Sugar Cookie Bars melt in your mouth. They taste like Lofthouse sugar cookies. I absolutely love sugar cookies. Especially the soft, melt in your mouth variety with a thick layer of frosting. You know…. the kind you buy at the grocery store a la Lofthouse??? (No, I’m not afraid to admit loving store-bought cookies). Unfortunately, most of the time I can’t be bothered to make my own sugar cookies though. The process of making the dough, chilling it, rolling it out, cutting it into tiny little shapes, and painstakingly decorating each cookie is an entire afternoon process. And frankly – a lot of work that really tests my patience. 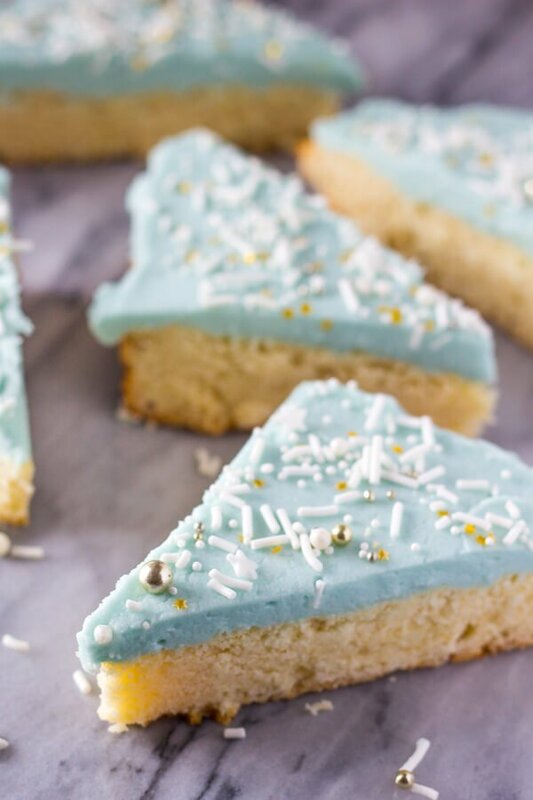 This my friends, is why we’re making Frosted Sugar Cookie Bars. 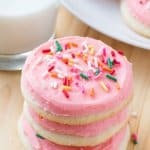 They’re deliciously soft with a thick layer of creamy frosting and 1000X easier than making cut-out sugar cookies. (Ok – maybe 1000X is a bit of an exaggeration….) But these are absolutely delicious. 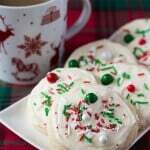 Plus there’s no dough chilling and no need to tirelessly decorate 30 cookies. Instead we make our dough and bake it in an 8×8 inch pan, frost the entire thing with creamy buttercream, then cut into bars. Way less work and so tasty. 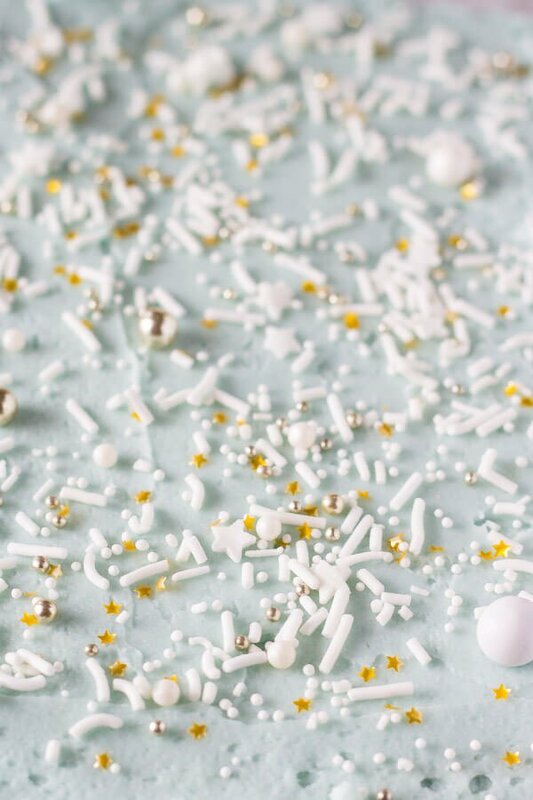 The gorgeous sprinkles I use are from Sweetapolita and my absolute favorite because they make everything look pretty, even if you aren’t an expert decorator. Ok – now onto the details of our recipe. 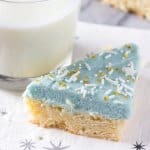 The sugar cookie bars are super soft for a few reasons. We’re starting with real butter. Adding a little cream cheese keeps them extra soft. Then cornstarch and cream of tartar makes them melt-in-your mouth. 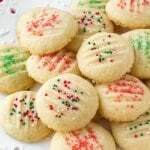 The flavor is buttery with a hint of vanilla and almond extract for the perfect soft sugar cookie taste. Then the best part: the creamy, smooth frosting. No hard, overly sweet royal icing here. Just super smooth, fluffy, creamy buttercream style frosting. I like to add a little cream cheese to the frosting to cut the sweetness. 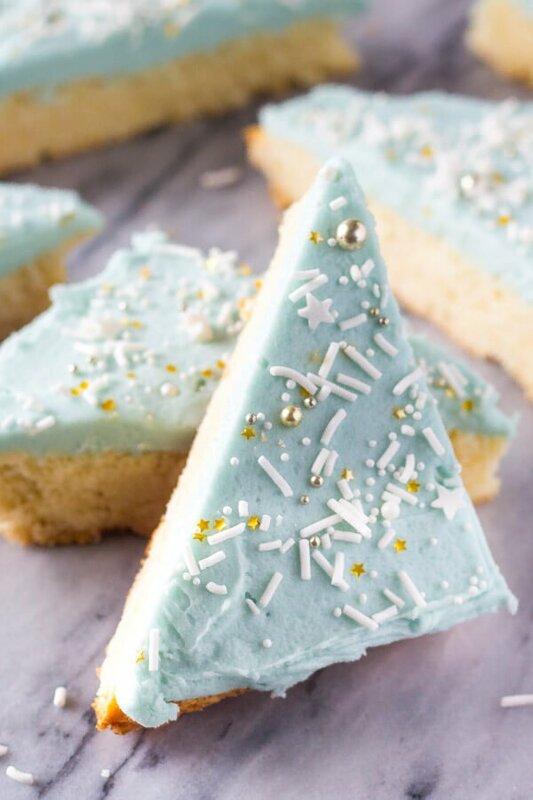 It isn’t enough to taste like cream cheese frosting, but it adds delicious creaminess and keeps the frosting not too sweet. Preheat the oven to 350F degrees. Line an 8x8 or 9x9 inch baking pan with aluminium foil and grease lightly with non-stick cooking spray or butter. In a separate large bowl using a stand or hand-held electric mixer on medium speed beat together the butter, cream cheese and sugar until evenly combined and no lumps remain. Add in the egg, vanilla and almond extract and continue beating until combined. Then turn down the mixer to low speed and carefully beat in the flour mixture about 1/2 at a time until mixed. Turn off the mixer and scrape down the sides of the bowl as necessary. Spread the batter into your prepared pan and bake for 22-25 minutes or until the top is set and the sides are just beginning to pull away from the edges of the pan. Allow to cool fully before frosting. In a medium bowl using a stand or hand-held electric mixer, beat together the butter and cream cheese until evenly combined and no lumps remain. Turn the mixer down to low speed and carefully beat in 2 cups of powdered sugar and the vanilla. Turn the mixer up to medium speed and beat in the whipping cream 1 tablespoon at a time, adding an additional 1/2 cup of powdered sugar as necessary to get the desired sweetness level and consistency. The frosting should be smooth and thinner than the consistency of peanut butter. Finally beat in the optional food colouring about 2 drops at a time. Remove the bars from the pan, and frost with a flat-edged knife. 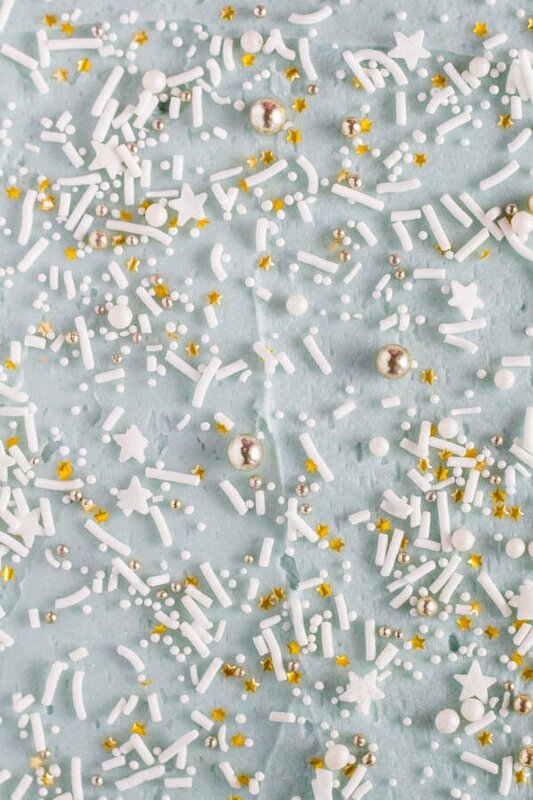 Optionally decorate with sprinkles and cut into bars. Great idea and the sprnkles really are beautiful. What color food coloring did you use? It is very pretty. Very pretty and retro looking!